Whereas many of us struggle to remember to feed a single pet goldfish, Labella enjoyed the responsibility of looking after an entire laboratory’s worth of fish. “I plan my life around fish feeding and fish collections,” she said. Labella spent her summer in biologist Ann Tarrant’s lab at Woods Hole Oceanographic Institution (WHOI), studying genes that regulate endocrine hormone pathways in fish that were exposed to chemicals such as bisphenol A (BPA), a potentially hazardous compound found in many plastics, and diethylstilbestrol (DES), a synthetic estrogen. In the lab, Labella measured how genes are expressed, or activated to produce proteins, in killifish exposed to BPA and in zebrafish embryos exposed to DES. 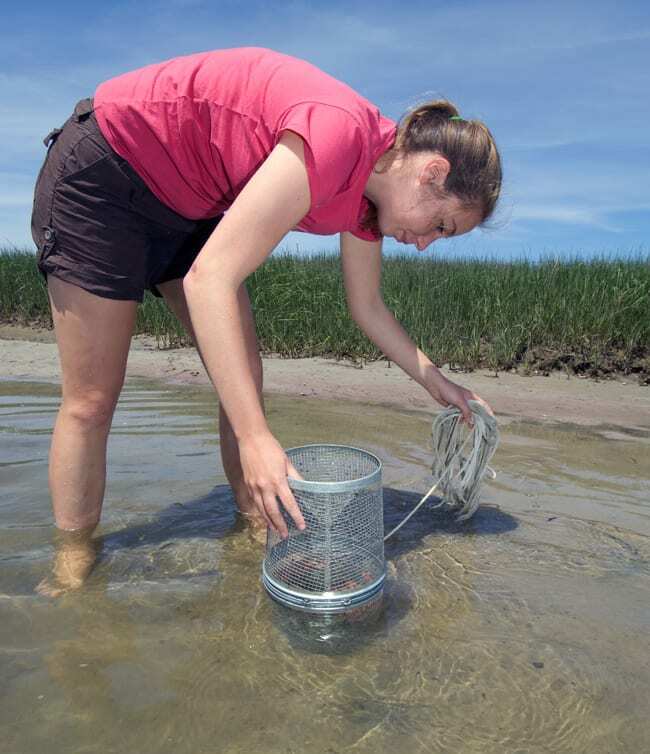 She also traveled to Scorton Creek in Sandwich, Mass., and New Bedford Harbor, Mass., to collect the fish samples. The independence afforded SSFs at WHOI has been Labella’s favorite aspect of her project, as well as the opportunity to learn new techniques. “We’ve been injecting embryos with a microscopic needle to knock down genes, which is a tool that I can use a lot,” Labella said. She also had high esteem for her SSF colleagues, whom she described as “impressive” and “really willing to share what they’re doing” in their own projects, as well as for her lab mates. “Lab work can be really fun when everyone has a positive outlook and a sense of humor,” she said. A biology major and physics minor, Labella is a senior at American University and a native of Ballston Spa, N.Y. She is also a devoted Ultimate Frisbee player, both at American and in Woods Hole. Her experience as an SSF has solidified Labella’s ambition to continue studying marine genetics in graduate school. Genetics is an interest Labella acquired in college, but she has wanted to be a marine scientist since childhood. After shadowing a marine biologist in sixth grade, Labella knew that WHOI was the perfect place to pursue this interest.